During the days in which I don't have the luxury of a U-Pass, my dad often drives me to the sushi restaurant I am about to visit on the condition that I pay for his food as well. On the surface, this does not sound like a good deal at all. However, he is my dad and he eats so little food that my bill only goes up by about $5. This $5 was easily saved by venturing to the land of the inexpensive and sometimes decent sushi, also known as Maple Ridge. On our way there, my dad accidentally drove just a hair past 207 St. and it took us almost 10 minutes to rectify this mistake. This involved so many tricky twists and turns that my dad started to believe this was a bad omen telling us not to visit the restaurant. The fact that the air quality in that area of town was particularly foul that day and the fact that the restaurant looked almost deserted didn't help. (Note that this was at 2:45 p.m.) When we hesitantly walked in, I quickly noticed that there was one diner in the restaurant who was alive and enjoying his meal, which helped me convince myself that everything was probably going to be alright. The Umibe Combination came with a Miso Soup, Gomae, a California Roll, Tuna Nigiri, Salmon Nigiri, Ebi Nigiri, Tempura, and Chicken Teriyaki. My dad remarked that the Miso Soup was garnished with a small amount of green onion and tofu, and that it was served at a hot tempurature with rich miso paste. 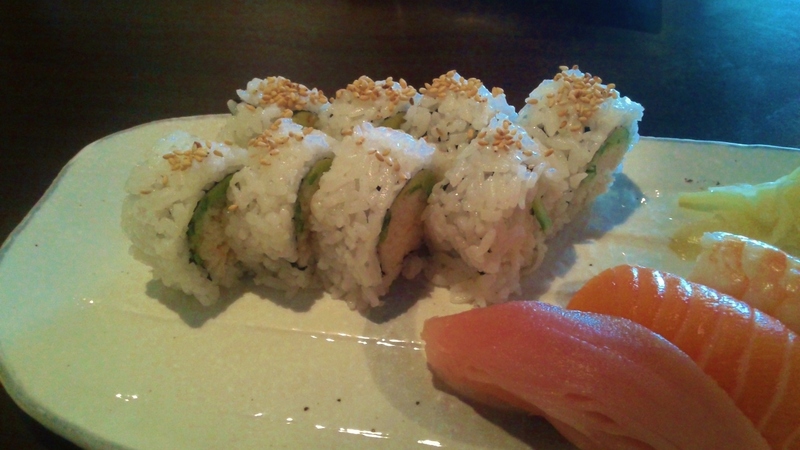 Sushi Umibe nailed the basics with the California Roll, which was neatly constructed and enhanced by sesame seeds. The mayonnaise and crab combination was tasty with the right textures. 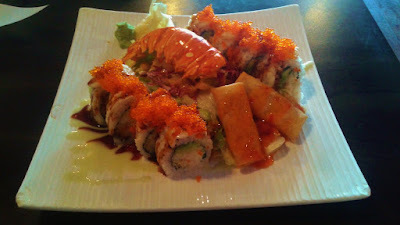 My dad really liked this roll too and wanted my mom to be able to try it, so he had to keep telling me again and again to stop eating the whole thing. 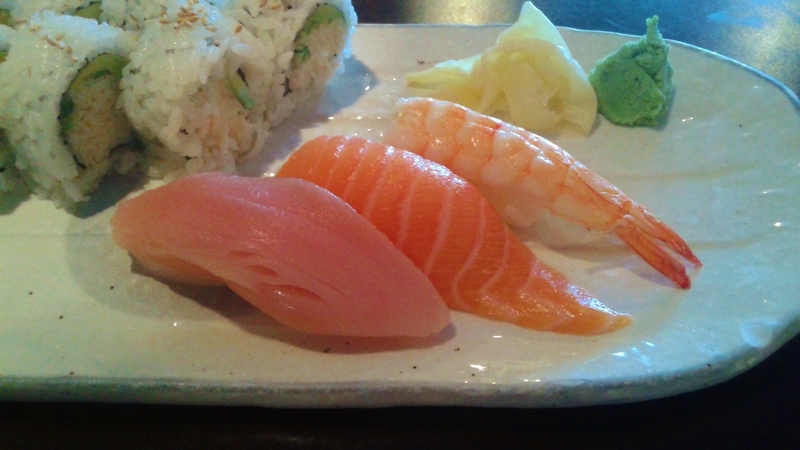 The Tuna Nigiri was fresh and sufficiently soft, while the Salmon Nigiri exhibited a mild, buttery flavour. The Ebi Nigiri was my favourite as it was fresh and quite meaty. 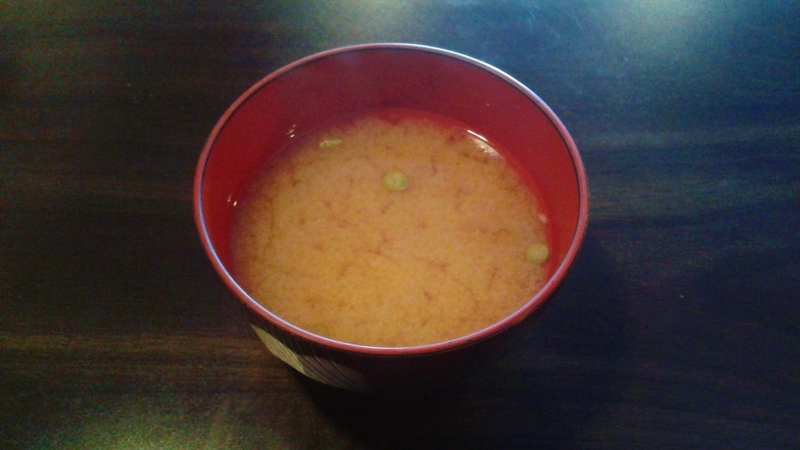 The sushi rice was adequately seasoned but packed a bit too tightly. 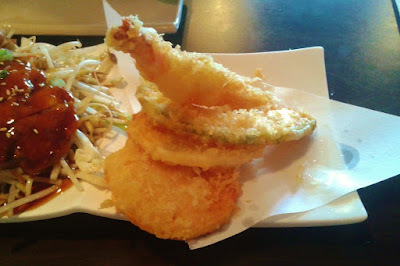 The Assorted Tempura was rather disappointing because it was fried using old oil and the batter was quite thick. The one piece of prawn was quite tasty and would have been a decent piece of tempura had it been fried with better oil. The kabocha was sweet but rather dry and the sweet potato was harder than expected. The yam was sliced into a peculiarly thin piece that resembled a potato chip. 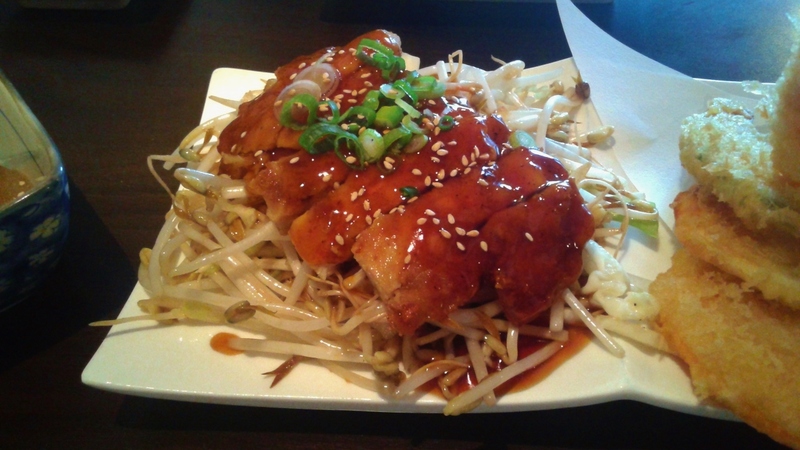 The Chicken Teriyaki came with tender, juicy chicken dressed with a good amount of teriyaki sauce. It didn't come with rice, so I had to pay an extra $1.25 for a bowl of steamed rice. My dad enjoyed the Chicken Teriyaki and so did I, although it would be nice if the pan-fried skin was slightly thinner. 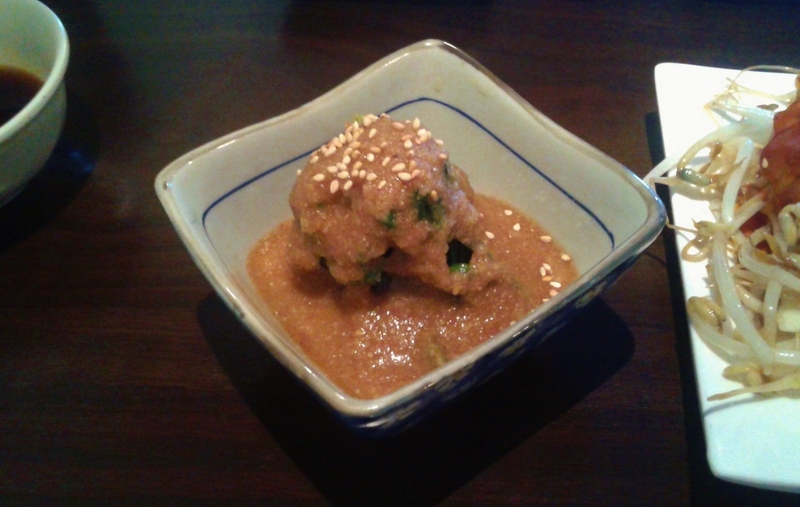 The Gomae was dressed with copious amounts of sesame sauce and fresh spinach. The sesame sauce could be ground more finely and spread out better throughout the spinach. The Lobster Roll consisted of cucumber, avocado, crab meat, prawn tempura, lobster, and tobiko along with 2 spring rolls and a salad. The spring rolls were dressed with spicy sauce and the pastry was a little hard, but there was enough flavour. Although this was the cheapest Lobster Roll I have had ($13.95), it was also the most stingy in terms of the amount of lobster provided. There was barely any meat in the tail and it was next to impossible to taste the small bit of lobster on top of each piece of the roll. Although the roll tasted decent, I would have enjoyed it much better if they had given it a different name, such as "The Splendid Roll That Comes With Glamorous Spring Rolls and a Beautiful Salad". The service was decent and the waitress didn't appear to mind the fair number of times I changed my mind while ordering. The food came out quickly and there was a number of enjoyable dishes during our visit. 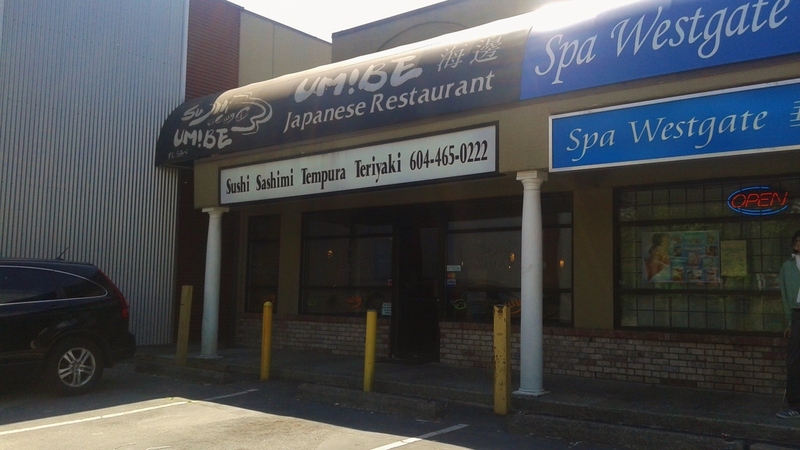 The prices were on the lower side like many of the other Japanese restaurants in the vicinity. Overall, my dad and I found the restaurant neither very bad nor very good. Judging from the other online reviews, it appears that the restaurant either had better days in its past or happened to be jinxed along with my dad and I from the bad omens.